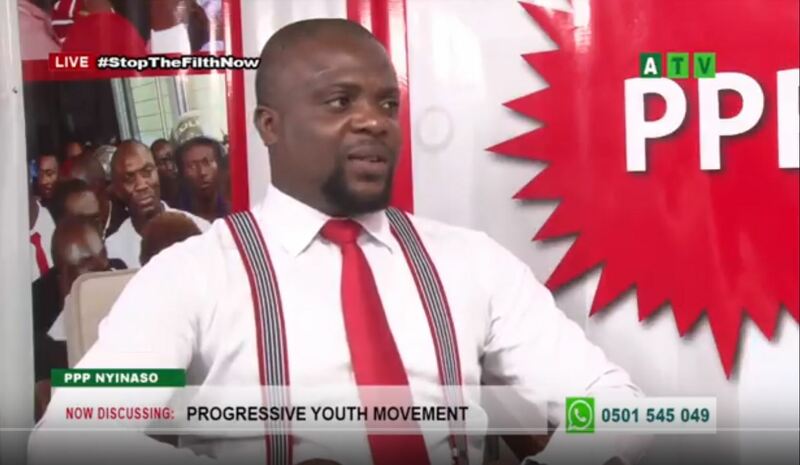 The National Youth Coordinator- Mr. Divine Nkrumah has said, the combined efforts of the youth wing of the Progressive People’s Party has brought the party this far. Mr. Nkrumah was explaining what Progressive Youth Movement (PYM) is about on ‘PPP Nyinaso’ a PPP TV show which is aired every Tuesday. In his submission, Mr. Nkrumah said, the youth wing of the party can be found at all levels, that is; national, regional and constituency. He explained further that, the PYM is the tertiary wing of the youth in the party. He said, there are 82 public tertiary institutions currently in Ghana and the PPP has established PYM chapters in 62 institutions which are all functioning. When asked what the purpose of the PYM in the tertiary institutions? Mr. Nkrumah indicated that, the PYM was established to promote the policies of the PPP in the various schools similar to what other political parties does in our schools. ‘These students will eventually become the future leaders of the country and they must be mobilized and empowered to be able to take over the party because, the Progressive People’s Party was established to help Ghanaians and it has come to stay’ he said. According to Mr. Nkrumah, activities of the PYM included but not limited to the following; meetings to mobilize students to become members of the party, organize workshops, symposia, and entrepreneurial training programmes for students who form membership of PYM. He elaborated on some unique achievements of some youth members of the PYM. These he said are; The Secretary General and West Africa Coordinator of the African Liberals Youth, are all members of the PYM. He as well mentioned the contributions of the PPP youth in the sub-region as commendable. Mr. Divine Nkrumah implored on Ghanaians to embrace the PPP because, it was formed to bring development and transformation to Ghana especially, the youth who form majority of Ghana’s population.